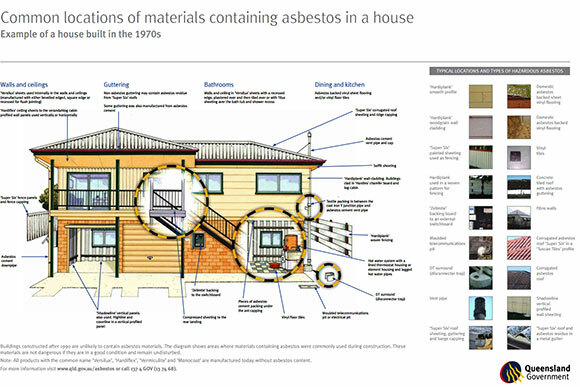 Removed asbestos must never be stored, sold or given away. If you are planning to remove 10m² or less of bonded materials containing asbestos, you do not require an asbestos removal certificate. However, you will still need to take safety precautions to minimise asbestos fibres getting into the air. obtain your own asbestos removal certificate. Here at Handi Skips, we are licenced only to TRANSPORT asbestos. It must be removed by someone with an Asbestos Removal Licence, or the owner (if it is less than 10m²). All asbestos (and other waste contaminated by the asbestos) must be placed securely inside a Hazibag that will be supplied by us at the time of ordering your skip bin and included in your price. We no longer accept asbestos that is wrapped in plastic – ONLY HAZIBAGS. Included in the price that you will be quoted over the phone, when you call our office, will be the cost of the skip bin hire, the Hazibag/s required for the amount of asbestos being transported, the delivery and collection fees of the skip bin and all associated costs of the paperwork and dumping fees at the local council transfer station. It is your responsibility to ensure the asbestos is removed safely and efficiently to reduce the exposure to dangerous fibres. Your Hazibag will be sealed in a bag, you will need to open the Hazibag and lay it in the skip before loading. The driver will secure the load when it is being collected. It is also your responsibility to load the asbestos into the Hazibag without overfilling it. It must then be sealed (zipped shut) as soon as possible to again reduce the exposure to airborne fibres. Asbestos must be kept separate from all other materials. If there is ANY DOUBT whatsoever as to whether or not the material is ASBESTOS, please treat it as asbestos. As all of our skip bins are taken to our yard for sorting and recycling, ILLEGAL DUMPING OF ASBESTOS WILL BE FOUND. If asbestos is found loose in a skip, hefty fines will apply. All fines incurred by Handi Skips from the Local Council and/or Environmental Protection Agency will be passed on to the customer and may be referred to Collection Agencies in the event of non-payment.